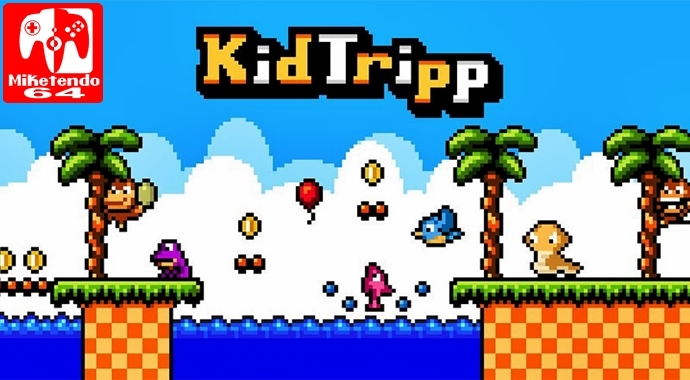 If you’re wondering why the name Kid Tripp might sound so familiar, it’s because it’s a great handheld game that has already seen a release on the 3DS and iOS platform before at long last making its way to the Nintendo Switch, but is it any good? In terms of size, Kid Tripp consists of 20 levels, spanning across 4 uniquely designed worlds each containing 5 levels each. The game is very bare bones to be honest but for the price it asks, it is definitely worth it. Albeit the game is brutally short but it makes it up on how well the levels are designed and how hard they are! You are thrown straight into the deep end and without knowing the controls I died instantly. The fact that it constantly adds new elements to shake the gameplay up was really nice. It reminded me of the first ever Super Mario Bros where it teaches you everything in the first level. You learn for instance water is bad news (unless you jump out of it) and you shouldn’t run into enemies. This serves as a tutorial and is superb at teaching you the basics and getting to grips with the mechanics. The gameplay is action packed with thrills and spills throughout and the visuals only complement it even more. The retro aesthetic makes it look and feel like you are playing one of the classics from the SNES. You can however tell it was originally on mobile as it’s an auto runner which means you don’t really control the character. This felt quite restricting for a platformer as I would expect to be able to control my characters movement fully. This is why it’s challenging because you don’t have full control, you have to use your ability to slow down and get faster a lot. Apart from the auto running nature of the game you do however have full control over the jumping and shooting. Jumping corresponds to A, Y and L whilst Shooting is B, X and R, the ability to use multiple buttons is great for tackling tricky areas. The core gameplay is super fun and you can’t go wrong for the excellent price of £3.59! The sound tracks are also really catchy and go hand in hand with the graphics. The ability to pick between how fast or slow you run is also good as you can pick just the right speed. In terms of replay value there nothing much here. Unless you want to go through the 20 levels at a different run speed nothing will really make your play through different from the last. You do have challenges which serve as trophies, I liked these as it encourages you to go for different goals and try out different tactics to complete them. The game has some tough as nails platforming and not to mention you only have 10 lives throughout your full game. You can earn additional lives throughout levels and in the event you do lose all your lives you can always continue from the previous level you happened to die from. Overall Kid Tripp is an excellent game with great level design and music. It is however excessively short (game can be beaten in an hour,) but for the price it asks, Kid Tripp will be an excellent addition to anyone’s Nintendo Switch library, especially when you consider the fact that it is one indie game on Switch that does run at a full 60 fps.